Talking about crumpets got me thinking about another bread product. If you take bread dough, and form it into small spheres, slightly smaller than your fist, and press then down a little and then bake them, what are they called? It’s a ‘soft bread roll’. Of course, you can make them crispy or slightly chewy, but it’s a bread roll (in the UK). Soft bread rolls are usually used to make a sandwich of some kind, with either hot or cold food. There’s a picture of one to the top-left. The fun thing about bread rolls in the UK (of this nature) is that they have a hundred different names depending on where you live. Bread roll is the more common name in the south of the country, or it’s a cob if you’re from the Midlands, or a bap maybe a little further north in and around Yorkshire, a barm cake, a tea cake (not to be confused with a tea cake which has fruit in it), or a breadcake. Some things it is not, it’s definately not a stotty (that’s a specific type of bread cooked in the bottom of the oven), it’s not a muffin despite the fact that some people may call it one in some parts of the UK. And because the name of this item varies from place to place, and overlaps with other bread products, even in somewhere as small as the UK it can be hazardous asking for something in a shop because you might end up with completely the wrong thing. 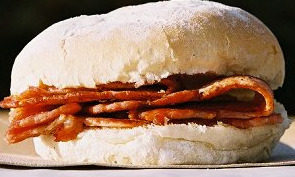 So, where I live now, this is a bacon cob, and it’s delicious. And I’m having some for breakfast tomorrow.